Commissioners Prof. Abdi Yakub, Margaret Mwachanya threatened to Join in the Resignation of Dr. Roselyn Akombe before the October polls. -IEBC Chairman Wafula Chebukati warned. - Bana Kenya News, Real African Network Tubanane. Home featured World Commissioners Prof. Abdi Yakub, Margaret Mwachanya threatened to Join in the Resignation of Dr. Roselyn Akombe before the October polls. -IEBC Chairman Wafula Chebukati warned. Commissioners Prof. Abdi Yakub, Margaret Mwachanya threatened to Join in the Resignation of Dr. Roselyn Akombe before the October polls. -IEBC Chairman Wafula Chebukati warned. More shocking revelations on the IEBC wrangles as one commissioner resigned. Two more commissioners have also shown interest in resigning following the commission attack from a political party. Commissioner Margaret Wanjala Mwachanya and Commissioner Prof. Abdi Yakub Guliye have revealed that they are also ready to resign following the rise of the Political Temperatures. She resigned on 18th Oct, 2017 barely an year in office. She had traveled to Dubai to supervise the printing of presidential ballot papers for the 26th Oct 2017 repeat polls, when she escaped from the rest of the team. It is believed she fled to the US where she holds a permanent residence and then sent the message of her resignation to the BBC newsroom. Kenyans responded angrily to what appeared as lack of professionalism and nationalism by neglecting her responsibility. Her resignation was viewed as part of partisanship move culminated by the need to consolidate the opposition coalition efforts to have IEBC reconstituted before the repeat presidential election. 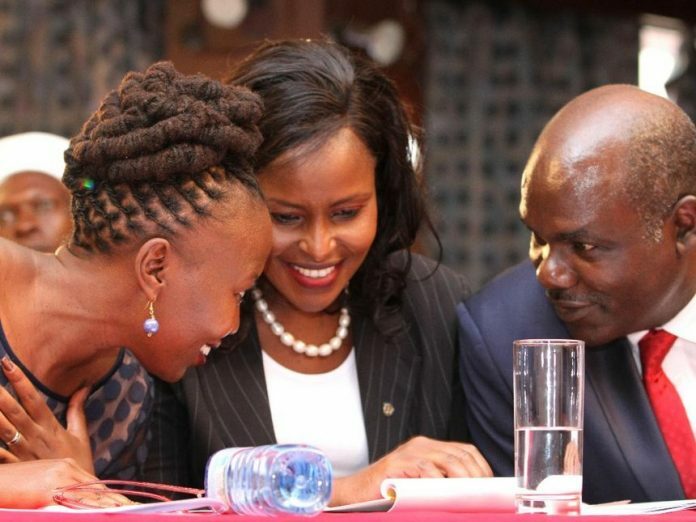 In her resignation, which comes only seven days to the repeat election, Dr. Akombe says the Independent Electoral and Boundaries Commission (IEBC) is under siege and at the heart of the ongoing political crisis. “It has become increasingly difficult to continue attending plenary meetings where Commissioners come ready to vote along partisan lines and not to discuss the merit of issues before them. It has become increasingly difficult to appear on television to defend positions I disagree with in the name of collective responsibility." "I have concluded that I am no longer making any significant contribution to the Commission and to my country as a Commissioner,” she said in a letter sent from the New York. She further challenged the electoral team, to be frank with the Kenyan people and clearly state the challenges they are facing in organizing a free, fair, and credible election. “We need the Commission to be courageous and speak out, that this election as planned cannot meet the basic expectations of a credible election. Not when the staff is getting last minute instructions on changes in technology and electronic transmission of results. Not when in parts of the country, the training of presiding officers is being rushed for fear of attacks from protestors." "Not when Commissioners and staff are intimidated by political actors and protestors and fear for their lives. Not when senior Secretariat staff and Commissioners are serving partisan political interests. Not when the Commission is saddled with endless legal cases in the courts, and losing most of them. Not when legal advice is skewed to fit partisan political interests,” she stated. Senior officials at the IEBC have threatened to resign if the current situation will not be contained. They claimed that the commission is being directed by a political party where it will be very difficult to perform free, Credible, Verifiable and fair elections as directed by the Supreme Court.